Although I am a tea lover, there is at least 1 type of tea that I know I absolutely detest. Before I knew any better, I thought rose hip and hibiscus tea would taste like how it sounds - lovely. But after I've had some rosehip and hibiscus tea, I realised it was just a misnomer. Something so sour shouldn't have su ch a pretty name. I gave it a few attempts just to be absolutely sure it wasn't something I would learn to like. So now I am absolutely certain I absolutely detest anything with rosehip or hibiscus in it! So when I bought this ginger and lemongrass tea from the tea merchant at the market, I didn't expect any hibiscus to be in the mix. I know this tea merchant has really nice Earl Grey tea and on that basis, decided that any other tea from there would be of a good standard. I came home with my new purchase and brewed a cup. Alas, the tea turned red, a sure sign of rose hip and/or hibiscus. The lemongrass and ginger flavour could not overpower the offending ingredient. So after a couple of cups, I decided that I would pick out the hibiscus from the tea leaves. And so I did, with a plate perched on my lap while I watched TV, I picked out almost every offending red bit. The ones that were too small, I left them in there, I doubt it would do too much damage to the overall flavour. And then I brewed a new cup without the hibiscus and it was just the way I like it. How much do I love tea? Let me count the varieties I have in my pantry... At any given time, I think 10 would not be an exaggeration. I compile a mental check list: 5 different types of Chinese tea including the marvellously, light and fragrant treasure my ex-colleague, Johnny carried over from Taipei when he last came for a work trip, my morning wake-me-upper, Earl Grey, Lady Grey with its citrussy twist, a Japanese genmaicha from our favourite Surry Hills Japanese restaurant, the strong Ceylon tea (good with milk) which a lovely fellow tea-lover bestowed on me, the Jasmine-green tea which is the only thing G would drink and a few of those lovely tea balls which bloom into a lovely floral bouquet, as much a treat for the eyes as for the palate - a lovely birthday present which came with its own glass teapot for the visual enjoyment of this spectacular tea. And finally a masala tea which yet another ex-colleague brought home from a work trip to India. I think that makes a dozen. As I review my mental check list, I realise how tightly friendship is tied in with the tea. Many of these teas have been gifts from friends and colleagues, people who know my love for tea and who have made the effort to remember and carry a little box of tea leaves back for me from their various trips. And with every cup I drink, I drink in more than the warming liquid, I drink in the friendship and affection that come with it. Not as dramatic as the scarlet red photos that were in the papers because I was still snug under my duvet at the early hours of dawn, but this was about 7.30 am when G got me out of bed to have a look. It had the old photo, sepia-tone look about it. Quite pretty so I didn't think, "OMG, the end of the world is here!" as did many of the other people who apparently were up and about earlier (and who had watched too many recent Hollywood end-of-the-world movies). 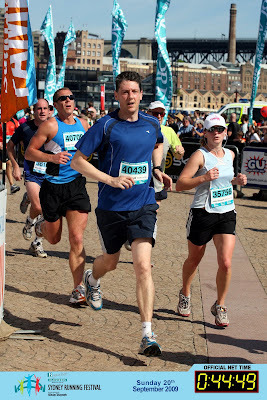 Finishing Line - Made It! That's my Boy coming in top 10% of all finishers for the Sydney Bridge Run. He reckons this is a bad photo but we all tell him, this is HOW people look after they finish running 9 km uphill and downhill. They are not expected to look immaculate, hair in place, make up not running (well this is Sydney, boys also wear make up). So honey, this is your 15 minutes of fame plus a good use of the $30 paid for this photo! I have a confession. 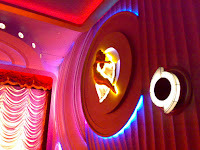 I have been joining a huge group of OAPs for a monthly movie luncheon at a beautiful Art Deco theatre, the Orpheum. Everyone there is white, over 60 and belongs to various clubs, associations and societies. (note to self: google up "Probist club" which is where many of these people are members of and I have no idea what it is) My presence offers a wee bit of diversity, it doesn't really bother me anymore. I think I'm used to it. The monthly movie luncheon is a lovely day out for these OAPs like them and unemplo yed people like me. 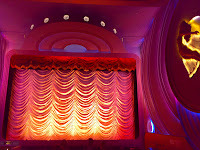 We get to watch a current movie in a lovely theatre with old-world charm, sip coffee or tea, enjoy our basket light sandwich lunch and pretend we are in a different era. All for a generous $13 deal, when a regular movie ticket would set me back $17 normally. I'm actually spending my budget wisely! I have another confession. After every movie luncheon (and I've been to 2 already), I make plans to come back for the next. This means that I am planning (or maybe not planning but kinda preparing myself) to be available on a Wednesday at 11 am when all "normal", productive people put on their suits and go to a job in the city. But I guess this (having a job where I can put on a suit and go to a job in the city) is not exactly within my control, so while I still can loll around in my jeans and tee-shirt, I should make the most of this deal and enjoy my day out with these lovely old people. I'm planning to go see "Mao's Last Dancer" in 2 weeks and I've been thinking about it since the last movie luncheon. Having moved away from my inner-city neighbourhood where the opp shops are plentiful and they stock really cool, bohemian and cheap (as in bargain) buys, I now have the choice of 2 opp shops here. The cheaper Vinnie's stock things which are common, mostly ugly and cheap (as in yucky Made In China). There had been a couple of gems in there though - the retro glass lemon juicer which I bought and The Magic Pudding book which I did not get as it was in the hands of another woman and I stalked her from aisle to aisle inside the shop, hoping that she would change her mind and relinquish that book. But she didn't. Well, you can't win them all. The Salvos on the other hand, must pride themselves as the Macy's of opp shops. They have crystal decanters lining their shelves, all sorts of English crockery and Italian leather jackets. Their prices are Macy's-like too. I think they forget they are an opp shop and view themselves as a nice, little, retail shop in an expensive Lower North Shore suburb and hence price themselves with their surroundings. I've seen a few things at this Salvos that I like - that lime green, soft-as-butter Italian leather jacket ($80 after a 50% discount) but didn't get (and it was gone the next day I checked), some English tea cup and saucer sets, a couple of crystal decanters. All of which I did not buy because I didn't come to an opp shop to pay Macy's prices. But today, as I was contemplating if I should buy a Noritake creamer jug with delicate flowers for $3, a little tea bowl caught my eye. Its cobalt-blue is just one of those colours I like in ceramics. I like tea bowls for their sturdy shape and their robust weight. They are simple and there is no nonsense about a tea bowl. And it was just $2. There was a potter's mark, but looks to be an amateur's mark I think. It is beautiful, functional and best of all, it was marked at opp shop prices.